1 The Renaissance, a rebirth of interest in art and science, appeared in different ways in different places. In Italy, the center of the Renaissance, it showed up as a rebirth of interest in classical Greek and Roman culture. In Flanders, a Renaissance center in Northern Europe, the Renaissance appeared as a more gradual change from the style of the Middle Ages to a more realistic and expressive style. 2 Flanders was what we now know as Belgium and part of France. It was some distance from Italy and other European cities where the Renaissance had already begun to flourish. Of course, Flemish artists had heard of Michelangelo, Raphael, and other Renaissance giants and were interested in their work. Flemish artists were also developing their own unique style in the 1500s. 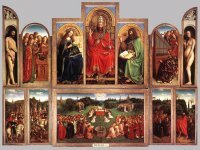 3 During the Middle Ages, miniature paintings had been popular in Flanders. These miniatures were the style used in illuminated manuscripts, books with tiny paintings for the initial letter on a page, or even full paintings in miniature. By the mid-1500s, however, interest in miniatures began to fade, and another style captured the interest of both artists and the public. 4 This new style featured large paintings meant to be displayed in public. With this large format, artists could go into much more detail in each painting. They began to create paintings that were much more realistic and expressive than earlier works of art. In fact, realism and facial expressions are two features that distinguish Renaissance painting from earlier styles.